WASHINGTON — Pedestrian deaths surged by an estimated 10 percent last year as the economy improved, the price of gas plunged and motorists put more miles behind the wheel than ever before, according to an analysis of preliminary state traffic fatality data. The growing use of cellphones distracting drivers and walkers may also be partially to blame, states a report released by the Governors Highway Safety Association, which represents governors’ highway safety offices. Warmer weather and shorter winters along with a greater awareness of health benefits may also be encouraging people to walk more. The data analyzed were from the first half of 2015. If the trend holds true for the full year, it would be the largest year-to-year increase in pedestrian deaths since 1975 when the current federal system for recording traffic deaths was created. The report is based on state traffic fatality figures, extrapolated for the full year by researchers at Sam Schwartz Consulting, which specializes in transportation matters. There were 2,368 pedestrians killed in the first six months of 2015, compared to 2,232 during the same period in 2014 — a six percent increase. Researchers arrived at a 10 percent increase for the entire year by factoring in that fatalities for the first half of the year are typically underreported, and that for at least the last five years an average of 25 percent more pedestrian deaths were recorded in the second half of the year, which includes warmer summer months, Retting said. Total traffic deaths, which had been trending downward for the past decade, were also up an estimated 8 percent last year. But pedestrian fatalities have been rising since 2005, and now account for 15 percent of total traffic deaths. The last time pedestrian deaths accounted for that large a share of traffic deaths was 25 years ago. 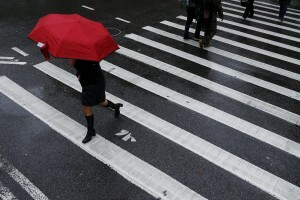 Pedestrian fatalities now account for 15 percent of total traffic deaths. The last time pedestrian deaths accounted for that large a share of traffic deaths was 25 years ago. Nearly three-quarters of pedestrian deaths occur after dark, and a third of those killed had been drinking alcohol, according to National Highway Traffic Safety Administration data. By comparison, about 15 percent of motorists involved in those crashes had a blood alcohol content at the legal limit or higher. Four large population states — California, Florida, Texas and New York — accounted for 42 percent of the pedestrian deaths in the first six months of 2015. States with the highest rate of pedestrian fatalities per 100,000 residents were scattered across the country — Florida, 1.35; Arizona, 1.27; Delaware, 1.27; South Carolina, 1.12; Mississippi, 1.07; Oregon, 1.04, and New Mexico, 1.01. The District of Columbia also tied Oregon for the sixth highest rate, 1.04. In a related issue, the Amalgamated Transit Union, which represents city bus drivers, estimates that roughly one pedestrian is killed every 10 days by a city bus because of blind spots in poorly designed buses. Wide “A pillars,” which connect the windshield to the driver’s side window, and poorly placed side mirrors frequently obstruct drivers’ view of intersections, according to the union. “Until the industry demands a change in the design of buses to remove the unnecessary blind spots like European buses, people will continue to die in these preventable accidents,” said Larry Hanley, the union’s president.